Mehran and Cultus are two of the most popular vehicles in Pakistan. The main reason behind this popularity has been their affordability, user-friendly features and a compact design. 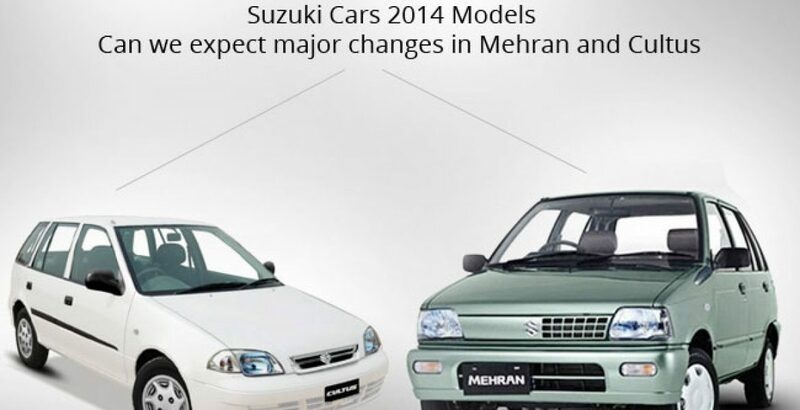 Among all Suzuki cars 2014, the sales of Mehran and Cultus are expected to remain high. Let’s take a look at the history of both the hatchbacks one by one. The following discussion reveals the reasons why these two vehicles are still in a high demand despite a lack of upgrades. Introduced for the first time in 1989, Mehran has been one of the most commonly used means of private transport in Pakistan. It is manufactured in the country by Pak Suzuki Motors and is actually a rebadged version of Alto’s second generation. The five-door hatchback has carried on with almost the same features year after year, with little modification. The compact car stands 55.5 inches high with a length of 129.9 inches and a total width of 55.3 inches. There haven’t been any alterations in these dimensions for the new model. Mehran’s power comes from its SOHC water cooled, four-stroke engine with a highway mileage of 18 KM and the city mileage of 16 KM. These basic features have been passed down from one model to the next for years. The 2014 model will be no exception to it. Although the major features of Mehran have not been changed, there have still been minor tweaks in technology and the interior is also slightly enhanced. Here are the main improvements brought to the car over a period of twenty-four years. The initial carburetor engines have been replaced by EFi machines in the recent models. This resulted in minor enhancements in the fuel economy by slightly increasing the mileage. In 2006, CNG models of Mehran were introduced for the first time in the country. However, CNG kits will not be found in 2014 due to the recent government ban on CNG models. The old models of Mehran lacked even the most basic safety features such as seat belts. However, the same facilities have been provided at both the front and back recently. The interior of the recent models has been slightly improved by including factory fitted air-conditioners and CD players. These basic and appealing accomplishments have been missing in the previous versions. Mehran is one of the most affordable vehicles in Pakistan’s automobile market. The 2013 version costs from 6 to 6.5 lakh. This price will remain almost the same for the next year as well. Therefore, the vehicle is within the reach of the masses. Due to its affordability, simplicity and adequate power, Mehran is also commonly used as a taxi in Pakistan. Its high sales have also been due to its purchase by taxi owners for their business. The car is small, user-friendly and easily manageable. It is, therefore, perfect for all types of drivers, especially beginners. Its average speed limit, turning radius of 4.4 meters and an overall compact size make it easy to handle it and drive safely. The future model of Mehran is not expected to introduce any major changes. Pak Suzuki Motors have not announced any official news about any facelifts or power upgrades for Mehran. Any such changes would inevitably raise the cost of the car, affecting its sales. It is the simplicity of Mehran which has kept it so popular for twenty-four years. Therefore, the company does not intend to bring any major changes to it. This supermini vehicle was introduced in 1983 in seven international markets. In Pakistan, the hatchback went on sale in 2000 during its second generation. The car runs with the power of a 997 cc engine with 5 speed options. The dimensions of the car, its shape and performance have not seen any major changes yet. EFi technology has been introduced for the vehicle’s engine. The latest model houses a G 10 B EFi Engine for more efficient performance. The interior has also been exposed to minor changes, such as the replacement of outdated cassette players with up-to-date Mp3 players. The fuel tank capacity has been increased to 40 Liters for longer family trips. The factory no longer produces CNG models. The fuel option is now confined to petrol. Just like Mehran, Cultus is also an affordable vehicle which falls within the budget of the majority of the potential buyers. The most recent model of the car costs around Rs. 1,014,000. This is less than the cost of most of the new models of lavish sedans and other extravagant vehicles. The car is compact, but offers a roomy interior. Therefore, it is a preferred choice among Pakistanis as a family car with seating capacity for 5 and sufficient cargo space. Comfort features include factory fitted AC, radio and Mp3 player. The vehicle is considerably fuel efficient. Therefore, future fuel expenditure, after purchasing the car, remains within budget. The compact car is easy to drive and manage. Moreover, the maintenance cost of Cultus is also low. Just like Mehran, the company has not released any official report regarding major improvements in the future model of Cultus. The overall design, ergonomics and power output are expected to remain the same in order to avoid an increase in price.